Essentially, the rapid rise of our technologies has outpaced our ability to adapt to them. Humans evolved over tens of thousands of years in conditions where fast food did not grow on trees, sugar was a rare treat only to be shared when someone was willing to climb a tree and raid a beehive, diets varied seasonally, and consistency in food items was rare. Oh, and we expended energy to retrieve the food. Obviously, this is not the case today and we are seeing the consequences. It is fairly clear that consistent and abundant access to high-calorie, poor quality food combined with a lack of physical activity leads to obesity and health issues (although there are certainly other variables that have an impact). People are very emotional about their dietary choices, and if you look around the internet, you’ll find hundreds of people touting magical claims about a wide array of different dietary options (paleo, vegan, low fat, high fat, on and on). There’s a lot of competing evidence, values, and beliefs tied into these claims. In some ways it seems that we are getting closer to ‘dietary truths’ (there is a lot of overlap that many characteristics of the SAD are not good for us), but it is very difficult to scientifically assess what a human NEEDS nutritionally and calorically to live compared to how they might THRIVE and also what best PREVENTS disease. There are just so many variables in the food itself, in the individual humans, and in the environments we live in. Given this, I’m not sure why it came as such a surprise when I first began to realize that we don’t know much about the diets of the animals we keep in zoos. Each animal has their own unique evolutionary history that has led to their diverse (or not) food sources, ability to cope with environmental fluctuations, and foraging strategies. If we haven’t been able to understand how these variables shaped our own diets, how could we expect to know this much about the diets of the hundreds of animals we keep in captivity? Zoos try to learn about the natural history of the animals that they keep, but there are many gaps in the scientific literature about wild animal ecology (some animals are extremely difficult to study), and there are variables that we can’t always (or are very difficult to) measure in wild animals’ dietary strategies How would we know the exact nutrient composition of their foods, caloric counts, etc.? And if we get close to finding out, how would we know that what they are eating is what is actually good for them and not just a treat they were eating during the period of our study? And then how would we account for seasonal differences, yearly differences, etc? Nature is complex! There are ways to study some of this, but it takes a great deal of time, money, and people to do the research. 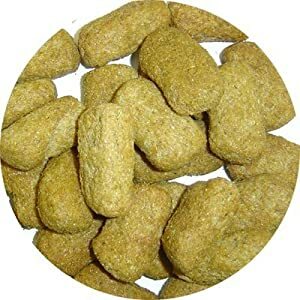 And so, many zoo animal diets are loosely based on research done with the closest related domestic animals – cats, dogs, horses, cows, etc. Bears eat dog food mixed with some produce; lions are fed similarly to domestic cats; zebras are fed similarly to a horse. 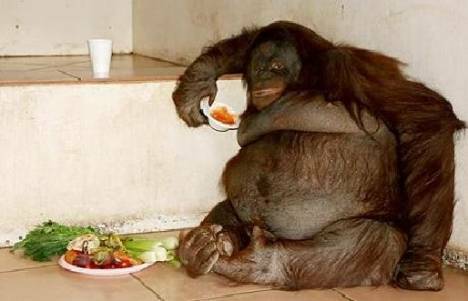 This is not what an orangutan should look like, and yes, this is a very extreme example. Photo Credit: The Telegraph. But many zoo animals also appear to be victims of the SAD (or their version of a diet that is not what they evolved to eat), and there is evidence that many of them are overweight. We also see a lot of health concerns arise in zoo animals that we associate with obesity in humans. As with humans, there are a lot of variables that might be accounting for this, and it is likely related to more than just diet — it could also be related to inactivity, lighting, individual differences, the list goes on…but it really started to raise a lot of ethical questions for me –both in terms of keeping all of these animals in the zoo when we don’t know how to best care for them, but also in terms of how I’m living my own life. I hope to continue on this topic further at another time (I’d actually love to write a book comparing similarities between “civilized” human behavior and health to that of zoo-housed animals), but I began this post because my thesis was recently published online, and it discusses some potential links between the diets of zoo-housed orangutans and some of their health and behavior concerns. While wild orangutans eat an extremely diverse diet of seasonally-dependent fruits, leaves, bark, insects, and even the occasional animal, their diet in the zoo is much different: they eat processed biscuits (the major ingredients of which are corn and soybeans), less fiber, and fruits & vegetables that were bred for human consumption (i.e., they’re higher in sugar and lower in fiber than most wild fruits and vegetables). You can find the abstract for the thesis at this link, or if you really felt inclined, you could download the whole thing! In any case, I hope that I’ve provided some food for thought, and I feel that the links between our own dietary crisis and how we feed animals in captivity deserves further attention. 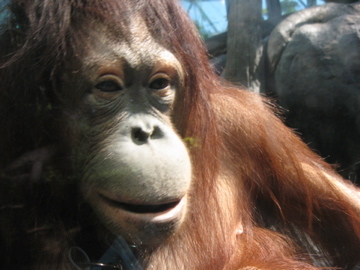 My favorite orangutan, Kera, has a chronic disease. I think I read in the intro to Ken Fern’s book, Plants For A Future, that a typical hunter-gatherer diet consisted of about 1000 different foods annually. I don’t know how they got this information. It sounds like a lot to me, but it’s food for thought. If you ever run into any studies detailing this type of info, let me know. I’d be interested in reading them. This is a great post that you’ve written. I look forward to reading the future post where you detail the comparison between humans and animals, especially pointing out the systems in which we humans have zooed ourselves. This is certainly my take on things, and I agree with you, it doesn’t have to be this way. If we’ve created these systems, we can certainly recreate them to change life for the better. It does seem like a lot to eat about 1000 foods annually, but I bet it’s a pretty accurate fact, especially for a lot of hunter gatherers. I’m sure it depends on the part of the world in which they are based, but plants come and go so quickly that we would have needed to eat a lot of different species to get enough. The list of known foods that orangutans eat keeps getting longer and longer…there are definitely hundreds upon hundreds of species that they eat, and we continually learn of new ones. They certainly have their favorites, but they really do have an extremely diverse diet (and interesting methods of culturally sharing what is appropriate/medicinal to consume!). I’m glad to hear that someone else sees the ways in which we’ve “zooed” ourselves — it’s something I always saw a bit of, but working in an actual zoo really drove it home. It’s not something I’m interested in participating in any longer – I’m much more interested in creating a new way to live! Thanks, Rebecca! It’s great that you want to feature it!